New hypertension guidelines were released in November 2017 by the American College of Cardiology (ACC) and the American Heart Association (AHA). These new guidelines mean that more than 100 million Americans will qualify for hypertension diagnosis. This translates to a U.S. prevalence of 46 percent. The first set of hypertension guidelines were published in 1976 by the Joint National Committee (JNC), which has revisited and updated protocols on the detection, evaluation, treatment and prevention of high blood pressure until 2014. The updated guidelines were influenced by the Systolic Blood Pressure Intervention Trial (SPRINT), which ended early due to the overwhelming evidence in support of more intensive blood pressure interventions. SPRINT aimed to see if lowering blood pressure below the current guidelines would help to further decrease stroke, heart disease, progression of chronic kidney disease and age-related losses of memory and thinking. The trial involved over 9,000 individuals who were followed in over 90 clinics across the U.S. for a period of four to eight years. Systolic blood pressure goal was below 120. Participants were 50 or older with a systolic reading at or about 130 mm Hg, and had at least one risk factor for heart disease. The trial was stopped early because overwhelming benefit was noted in the group who achieved blood pressure goals. Rates of heart attack, congestive heart failure (CHF), acute coronary syndrome (ACS), stroke, and cardiovascular death were significantly lowered in the intensive blood pressure management group, compared to the routine management group. 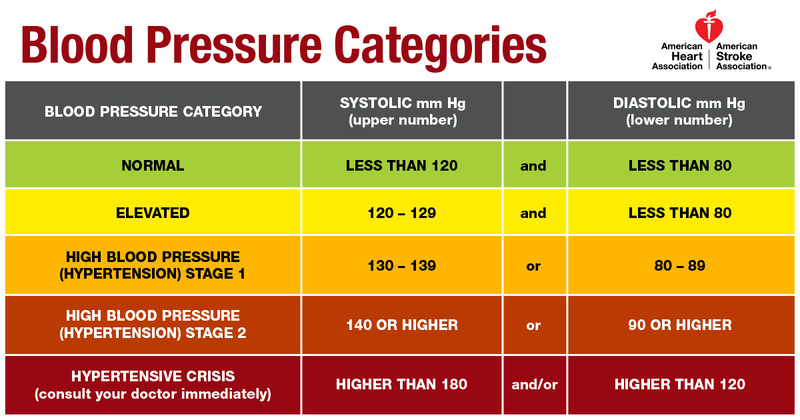 Creating these new diagnostic categories also means that more individuals will be diagnosed with elevated blood pressure, and especially with stage 1 hypertension. Across gender and ethnic groups there will also be distinct shifts in larger numbers of clinically diagnosed high blood pressure. The most significant impact is anticipated in adults age 20-44. These new thresh holds will also clearly change hypertension protocols and also impact treatment protocols. What do these new guidelines mean for you? High blood pressure is typically silent until it persists for a while, or elevates to a point where symptoms like headache or head pressure appear. If you have a family history of hypertension, carry excess weight, are not physically active, eat a highly processed diet which likely contains hefty amounts of sodium, drink alcohol daily, it would be prudent to be evaluated for hypertension. With the diagnostic thresh hold lowered, you should also be motivated to try and avoid developing hypertension by embracing the lifestyle recommendations offered above. Just adopting the DASH diet can help you to begin to limit sodium intake and begin to nudge some weight loss. Sit in a chair, feet flat on the floor, uncrossed, back supported, without talking for five minutes before the first reading is taken. Do not exercise, consume coffee or a caffeinated beverage or food or smoke within 30 minutes of a reading being taken. Empty your bladder before having a reading taken. Do not sit on the examination table or lie down – that can give a false low reading. Make sure BP cuff is wrapped on skin and not a clothing sleeve. Make sure the arm is well supported, NOT dangling or resting in your lap. It’s likely that your provider is not following all these steps. Given that you want a precise reading, it may be a good idea to bring these to your next appointment. Remember that blood pressure readings can vary throughout the day and be influenced by just knowing you are having a blood pressure reading taken. Will most primary healthcare providers embrace these new recommendations, and how quickly? Most doctors who were queried seemed prepared to immediately embrace the new diagnostic criteria and management protocols given the robust data that SPRINT provided. Still, some doctors and researchers question some of the methodology used in the trial. Kaiser Permanente insures over 8 million patients in California and currently beats national blood pressure control rates (theirs is 86.9 percent versus the national 55-65 percent rate). They do plan to do an evidence review of the new guidelines and based on findings, update their protocols. Insurance plans will likely get on board with these new diagnostic criteria, but in the interim, being proactive and having accurate measurement of BP, limiting your risk, and managing early signs of hypertension can help you to avoid this condition. Do Normal Blood Pressure Levels Change as I Get Older? Can Probiotics Lower Blood Pressure?